I rise at 09:30 and take down the tent, much to the delight of a pair of Robins, who dart about the place and peck at insects uncovered by the removal of my ground sheet. Saying goodbye to Helena and Papa, I give her the bar of chocolate which hasn’t melted since I received it as a free gift from the supermarket some days ago. Next week they will pack up the campsite for the season and head back to Leon, where Helena returns to university. I take the road back up the lake, then the LE473 to La Pola. A picture opportunity passes unrecorded as I slow down in Geras to let two nuns cross the road, their bright blue habits in perfect contrast to the sandy, sleepy streets. An equally unique road hazard also goes unrecorded some seconds later as I slalom around two sleeping and rather improbable St. Bernards. Those coats, in this heat? I’d be lying flat with my tongue hanging out too, somebody really should take heart and give them a shave. 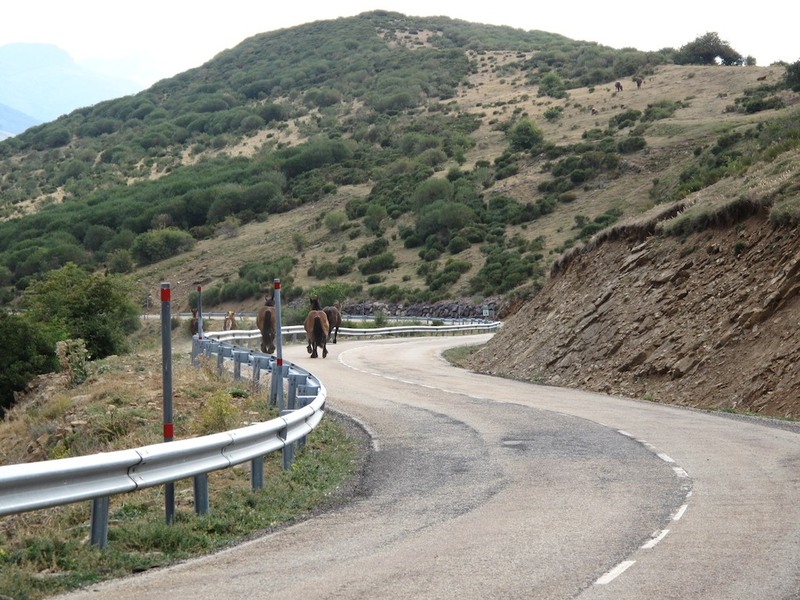 The road climbs to Collada de Arralla, and I spot a small herd of horses on the carriageway ahead. 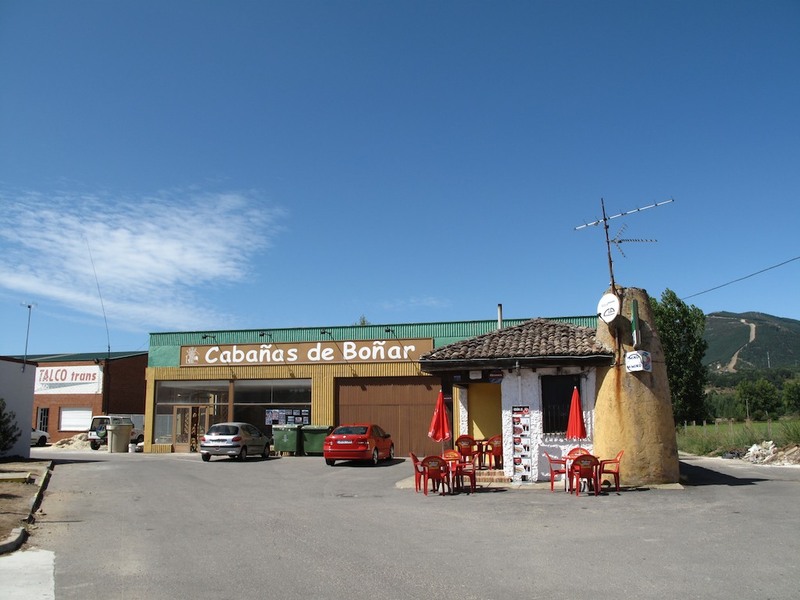 The three adults see me coming and trot off in the other direction, one limping slightly, while two foals are caught on the other side of one of the galvanized crash barriers which the Spanish have littered about the countryside in recent years. I can see there’s a gap ahead and don’t want to cause the animals undue stress, so I take it easy for a few minutes until the gap in the barrier allows them the chance to scarper into the hills. One foal remains and looks at me as I approach. I stop and fumble with the camera, but he decides he’s had enough and runs off to join the rest of the group. Taking the N630 north I head for Villamanin, passing two derelict petrol stations just as I’m getting low on fuel. The road is wide and there’s many lorries, again carrying aggregate. Villamanin turns to Camerones, which nestles in a magnificent gorge between more marble-cake hills. I stop in Bonar for fuel and get the best tank full so far because I insist on doing it myself. It appears that the average Spaniard can’t be trusted with petrol pumps, possibly due to their incessant smoking or the way that some of them drive, and hence every petrol station is a fully serviced affair. Unfortunately the service seems to consist of jamming the nozzle into ones tank and locking it on the catch before wandering off to perform some vital function, and letting the filling cease automatically whenever the nozzle cuts out. This may work for cars, but my bike has been regularly left with a quarter tank of air where there should have been enough fuel for 60 miles. Today I have the nozzle, and squeeze in 20 liters of the finest sin plomo. Also squeezed in are a large coffee and a bocadillo de queso, which would be a cheese baguette back home had it contained any butter. Not that it was lacking in the dairy department – the cheese was a cross between crumbly gruyere and emmental, and utterly delicious. Four Euros.